By Azwan Jamaluddin in Concept. Updated on September 29, 2015 . Many tech companies have their own skunkworks division, working on advance projects that may have nothing to do with the core of the company, or on ideas that may or may not be shipped out to the public. The most publicly well known skunkworks division in the tech industry has to be Google’s Google X, with famous projects such as the driverless car and Google Glass. But we bet you don’t know much about Microsoft’s pile of research projects. Microsoft’s skunkworks project may not be as well know as Google’s but that doesn’t mean that it had not come out with wild and amazing projects. In fact, they probably have come up with more since their research division was formed way back in 1991. In this post, we have sifted through the treasure trove of ideas to bring to you 12 amazing projects that show that innovation is still very much alive in Microsoft Research. The Courier was a Microsoft project to develop a dual screen tablet. The tablet was designed to look like a book, with each touchscreen acting as a page (like in a doublespread). The project never took off and was eventually cancelled in 2010. Interestingly enough, some of the engineers working on the project went on to found FiftyThree, creator of the Paper app on the iPad, which also rely on a book metaphor. Originally known as the Surface before Microsoft decided to use the name for their line of laptop/tablet hybrids, the PixelSense is a surface computing platform that allows multiple users to interact with a touchscreen. It is fully multi-touch and able to detect what kind of items that are touching the screen using infrared sensors and cameras. It is targeted towards business to be used in a public setting, for instance at a restaurant to display menus or at a clinic to display patient diagnostic reports and charts. Unveiled during the 2014 Recode Conference, Skype Translator is a near real-time translator app. It will allow you to talk in your native language to people who speak in a different language. The app will do the translation and speak it out to them. The project is a culmination of several different projects from Microsoft Research, from machine translation to speech recognition. The app is expected to be released in beta in late 2014. Similar to PixelSense, TouchWall is instead mounted to the wall and uses three infrared sensors to scan a surface. A camera will detect any break in the laser line and interpret it as an input. It is technically possible to project the display on any surface, turning it into a multi-touch computer in a matter of minutes. 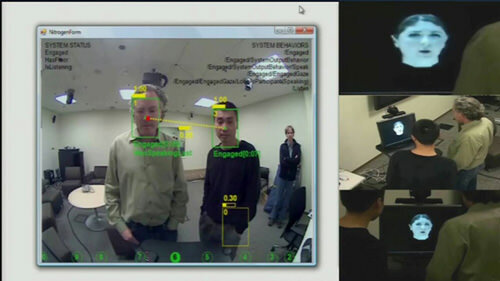 The TouchWall wasn’t intended for release but a similar idea was made by Ubi using Microsoft’s Kinect. HoloDesk allows a user to manipulate virtual objects in the real world, with the objects reacting to however the user choose to interact with them. The technology uses a see-through display along with a Kinect. The virtual object is rendered on the display while the Kinect will compute the actions made by the user. The Robotic Receptionist is a software-based robot designed to handle basic tasks that a real receptionist might do. The software uses facial and voice recognition to recognize the face and voice of the user and will reply in a synthesized voice. In an example, two Microsoft employees were asked where they wanted to go and once confirmed, the software told them of the arriving shuttle to take them there. When using a touchscreen, it is only the surface panel that is usable, while there is a lot of potential space behind the screen that could be used for something else. Think of how Sony’s PS Vita uses the back panel to integrate a touch surface. Microsoft unveiled such an idea back in 2007 with LucidTouch, a touchscreen that allows the user to manipulate both sides. In order to guide the user, the fingers will be projected as shadows when using the back screen. Apple released Homekit in 2014 as a way to control home automation on iOS but Microsoft have been working on a home automation operating system since 2010. HomeOS is an attempt to provide an easy interface that will connect together all automated home appliances, making it easy for non-tech savvy users to control their home. The system is under testing and has been installed in a few homes for 4-to-8 months. Pictionaire is a system that can turn a table into a multi-touch computer, allowing the user to manipulate digital objects using their fingers. It can also turn real objects placed on the table into a virtual object; the user then can manipulate it with digital tools. The technology involves the use of a DSLR camera on top of the table that will take a picture of the physical item and then digitize it. The digital items are "aware" of items and other surfaces on the table, for example, shrinking a picture to fit in a book. PocketTouch allows the user to interact with their smartphones without removing it from under fabrics e.g. from their coat pockets. It works by connecting a specially made touch panel to the back of the smartphone and this panel can capture an input even if it is covered by fabric. In this demo, the user is able to use PocketTouch to unlock the phone and skip to a new song, all without removing it from his pocket. IllumiShare allows users to digitize their workspace using a a device that will capture it and then project it to another user’s workspace, allowing both to share work and information. The projector will also project the user’s hand so you can see both users physical interactions simultaneously. In one example, two users were playing Tic-Tac-Toe together from two separate workspaces. Microsoft Research partnered with John Hopkins University to create a virtual planetarium and unveiled it in 2008 at a TED Conference. The project allows users to explore space in the form of maps, in 3D or as data points. Images are taken from several powerful earth-bound telescopes and the Hubble Space Telescope. It is available as a webapp and for Windows operating system.